I was all over the place with my feelings for this book. So Midnight Thief is a high fantasy book. It is NOT middle grade (like I assumed for some strange reason). It follows the same basic storyline as a few other popular YA high fantasy books- strong female character is doing illegal things, gets caught, and is put to work for the kingdom and all sorts of twists and turns happen. There is so much I want to say about this book but I can't. I will say though, that that cover is NOT a doorknocker like I assumed it was. The cover says so much more about the book than I expected. 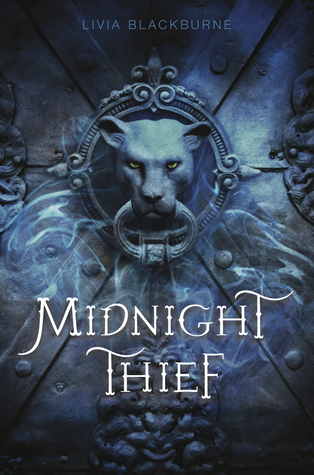 The Midnight Thief was a solid book for me. There was some romance (not totally swoonworthy, but respectable) and a ton of magic and adventure. I don't really want to pick apart this book because there is a fairly large twist and I don't want to give that away, but that being said, this was a solid high fantasy. Fans of Maria V Snyder, Shadow and Bone, and Throne of Glass will slip into this world easily. This is one that I'm pretty excited about. Hmm now I'm curious because I thought the cover was a doorknocker as well. Oh, how I want it! So, so bad! Loved your review, as always!